My love affair with Venice deepens. Especially Venice at night, and when it approaches the bewitching hour. The lion’s share of tourists in the main thoroughfares have dissipated. And when you wander off the beaten path, you can be a spectator of the comings and goings of the locals. This is when things get really interesting. The image above was taken just outside the entrance of Istutito San Giuseppe, a convent in the heart of Venice that offers affordable nightly accommodations (as long as you can abide by the 11 p.m. curfew). We were saying goodnight to dear friends when I spied the red dress, the star of this image, making its way across a nearby bridge. To make Venice at night even more mysterious, just look at the plethora of door adornments that are ripe with foreboding qualities. Consider this: the door to the aforementioned convent had this door pull at its entrance. Maybe I’m crazy but I’d expect a convent to be a tad more welcoming. This door pull, which epitomizes agony for me, would make me think twice before ringing the bell. Midnight comes and illuminated windows invite scrutiny. This is probably one of my favorite aspects of Venice at night––the illuminated windows. Go ahead, call me the Peeping Tom of magnificent interiors. I’m blown away at the chandeliers (often crafted of Murano glass) timber cross-beam ceilings, and centuries-old frescoes. These are glimpses you don’t get in daylight hours. The image below was captured at midnight. The stillness of the streets and canals of Venice are heavy with intrigue. An enoteca remains lively well past midnight. I love almost all aspects of Venice at night, save the drunken tourists or seasonal students sowing their oats during the wee hours. Most restaurants are shuttered by midnight, but many bars and enotecas seem to go with the flow of the evening and remain open. In the image below an enoteca in the Dorsoduro is not petering out. Conversation remains spirited, contrasting the subdued energy of the small osteria next door as their last customers linger. If you’ve enjoyed this brief photo essay, I encourage you to check out a previous post on the same theme. I’m not done with exploring Venice and night, and I’m will most likely dedicate an evening to pursuing such captures in a more concentrated fashion (vs. an add-on to a great outing with friends). I love a red dress–but the part of the picture that caught my attention at first was the girl in the little black dress. Love all this–I agree with the door knocker. Like the one at Scrooge’s house in London! Thanks for the encouragement, dear friend. Miss you terribly. Your time to come and linger in Venice is approaching soon, I hope. I’d love getting into the grout of Venice with you! I should probably be ashamed of myself but I just loved listening to the orchestras that play in Piazza San Marco. Touristy yes…but such a beautiful memory. I very much enjoy the music of Ennio Morricone….especially from the move Cinema Paradiso and we managed to hear multiple songs from that movie. Amy and I barely made if for the last hour of music….not realizing that they stopped at midnight….so I’ve promised myself a redo. Interestingly, that night we experienced our first transportation strike. The walk back to our lodging was indeed just as you describe….magical. Jed, your night time photos are gorgeous! I too love the orchestras playing Piazza San Marco. Sure, there are tons of tourists paying hefty sums for drinks and appetizers, but I have no problems drafting on the ambiance. Ennio Morricone is one of my favorites. Yo-Yo Ma has a CD entirely devoted to his music. It’s one of my favorite CDs to have playing when I’m painting. So glad you like the nighttime photos. More coming! Grazie tanti, Jed, you have gracefully touched on the magic of Venice. We fall in love with the mysteries of Venezia with each visit, love the light/shadows of the night in the byways and waters – am quickly transported to centuries prior. First trip was 40 years ago and it still beckons. Last trip wandered the Canneregio with all its twists and turns. Do enjoy the intriguing Rosetti Letter ~set in the yesteryear of the Doges Palace and surrounds. (have an aperivito at Squero for me). Hope to return soon. Prego! Venice really can work its tentacles into your soul. It keeps luring me back to explore deeper and deeper, which is why I pinch myself that I live so close. I definitely will pick up The Rosetti Letter. Thanks for the suggestion! Perfect! I will endeavor to read it in the height of summer’s heat––you know, like mental air conditioning. Jed, if you are looking for books set in Venice I highly recommend ‘In The Company of the Courtesan’ by Sarah Dunant. She also wrote ‘Sacred Hearts’, set in the convent in Ferrara, where you can still listen to the nuns sing behind the screens. I love her writing style as she mixes history with fiction seemlessly. I’ve read them both! And, I loved them. I was devouring them while on my last lap of American life––reminding myself of what was ahead while I was winding down and unraveling a well-established life. I see Sarah has a new book “In the Name of the Family”. Time to pick up yet another of her works. Meanwhile, keeping a foot in the States, I’m reading “Olive Kitteridge.” One of the best books I’ve ever read. Can’t believe it took me so long to pick it up. Your photography takes my breath away. Grazie, my friend! So glad you like! I adore the night. The world feels less intrusive as everyone retreats into their homes and slows their pace. Also, I don’t really feel you can know a place until you’ve experienced it at night. We did our first gondola ride at night, it was quiet, magical and unforgettable. I can’t wait to see more night photos! Hi Amy! I’m so glad this resonates with you. As you point out, you can be missing the beautiful, underlying form of a place if you view it with visual impediments and noise! I agree about gondola rides at night. Magical! Never made it past midnight since I didn’t want to miss the bus back to the Hotel. Once we took the water taxi all the way back (by the airport) Thanks Jed! On a subsequent trip you’ll have to stay in Venice one night and spend the midnight hour wandering! You won’t regret it. Thanks, Chip! I too love walking around town after dark. The city, in your case Venice, sheds the debris crowding around its feet and the buildings themselves breath and can show off. Venice is meant to be seen above all else and all others. At night she shares with you that magic and mystery. For what is magic without the mystery? Beautifully and poetically expressed! 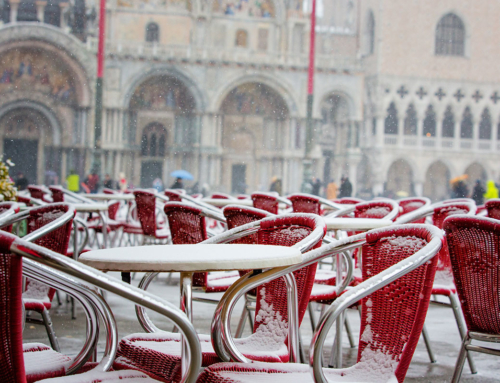 So many people can be turned off to the seemingly overwhelming crowds of Venice. But, as you point out, just wait for the crowds to thin and disappear and that’s when things really get interesting! Lovely photo. I wish I had taken it. Glad you like the image! These kinds of shots seem to present themselves out of the blue. I can’t tell you how many I’ve missed. I’m glad my trigger finger was ready for this one! Grazie mille, Nancy! I’m always on the lookout for books about Venice, and the spookier the better. Have you read Vaporetto 12 or Lucifer’s Shadow? Maybe I’ll attempt my own Venice novel one of these days!